Successfully Added Huadoo HG04 Rugged Smartphone - Quad Core CPU, Dual SIM, 4G, 4.7 Inch HD Display, 3800mAh Battery (Orange) to your Shopping Cart. Made for those who love the outdoors, or who have a habit of dropping their phones the almost indestructible HG04 rugged Smartphone from Huadoo is well protected against water, dust and drops, so it can handle all that life, and you, throw at it. With a quad core CPU and 2GB of RAM this rugged Smartphone offers a reliable energy saving performance that gets up to 10 hours of talk time for its 3800mAh battery. A 4.7 inch screen with its 720P resolutions is more than enough for enjoying games and movies while allowing the phone to remain compact and light enough that it won't weigh you down on your adventures. Packed full, with sensors galore this rugged phone doubles as a reliable outdoor gadget thanks to its GPS navigation and magnetic field sensor helping to point you in the right direction should you require a helping hand when out exploring. Equipped with two SIM card slots, one of which supporting 4G and the other 2G, you can easily switch between providers and cell phone numbers without having to undo this phones protective case. This will keep it safe and save you time while bringing superior network coverage for wherever you roam. Thanks to the high resolution 13MP rear camera the Huadoo HG04 lets you capture all the highlights of any trip with stunning photos or HD video so you can share your favorite moments and capture memories to last a lifetime. 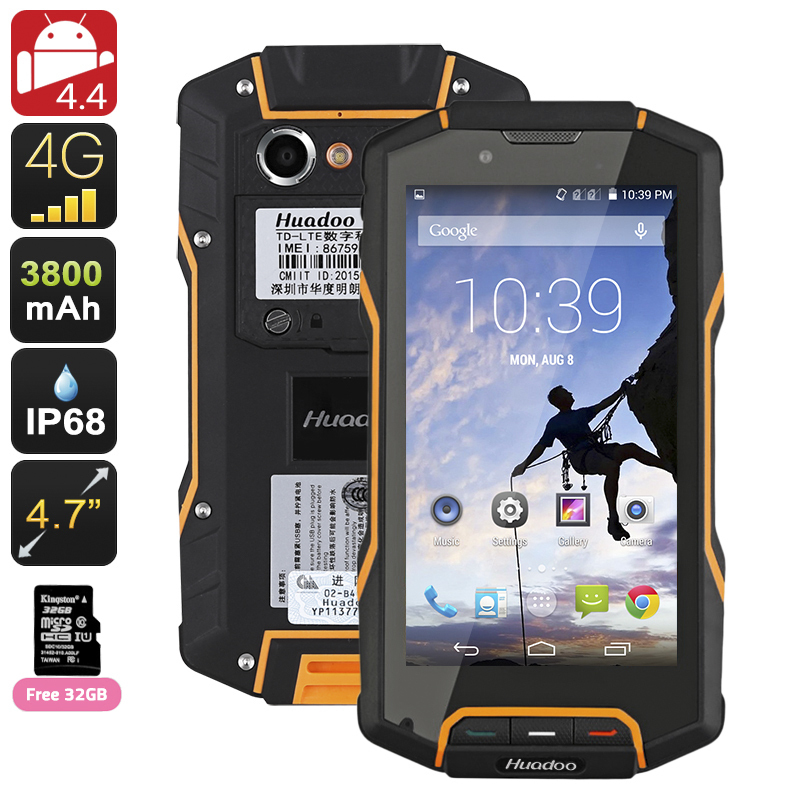 The Huadoo HG04 Rugged Smartphone comes with a 12 months warranty, brought to you by the leader in electronic devices as well as wholesale rugged Phones..